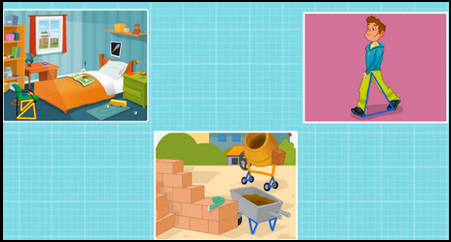 Triangles are used every single day, in furniture arrangement, movements, construction, and so much more. When you rest a staircase against a wall, you are making a right triangle because the wall makes a right angle with the ground, and the staircase closes the triangle. When you take a shortcut across a patch of grass to get from one side of the sidewalk to the other, you are walking in a triangle. Try to notice all the ways in which you are making triangles in everyday life. Triangles have three sides and three angles - tri - (three) - angle (angles). The sum of all the angles in any triangle is 180°. Triangles are characterized by the angles within them. Lets study them in detail. The name of this triangle helps to remember its properties: Equi means equal, and lateral means sides. 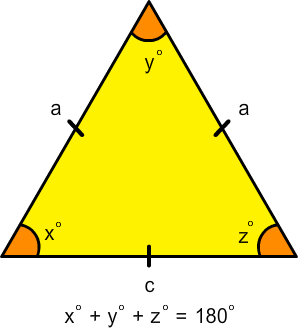 Equilateral triangles have three identical sides and identical angles. 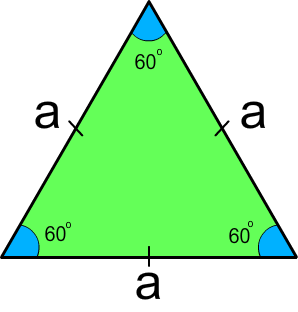 No matter what is the length of the sides, equilateral triangles always have three 60° angles. Two sides of a isosceles triangle are equal which means that two of its angles will also be equal. The base of a isosceles triangle is always shorter in length than the sides. If the isosceles triangle has a right angle, its called a right isosceles triangle. 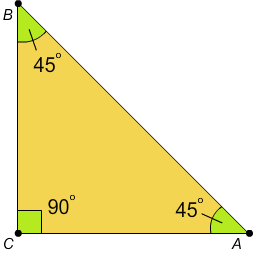 A right isosceles triangle has a right angle (90°), and two 45° angles. 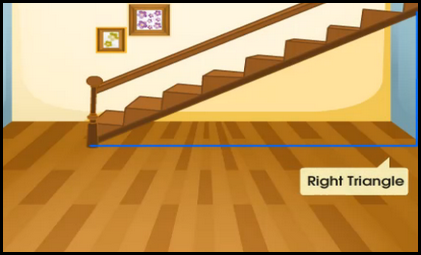 Right angles are shown by a square at the line intersection, rather than a curve. All of the sides and angles of a scalene triangle are different. Note: In scalene triangle, the Shortest side is opposite to the smallest angle and the Longest side is opposite the largest angle. Triangles have three sides and three angles - tri - (three) - angle (angles). The sum of all the angles in any triangle is 180°. Isosceles triangle have two side and two angles equal. 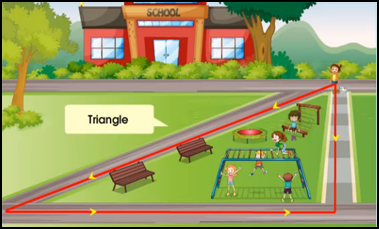 Scalene Triangle has all the sides and angles different.